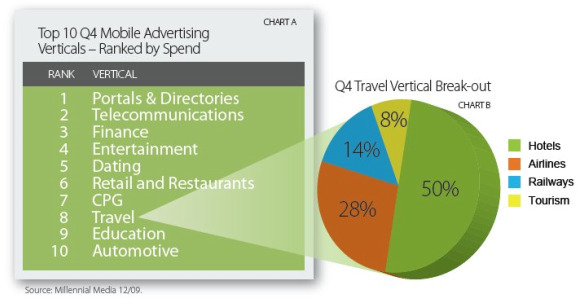 According to the U.S. Scorecard for Mobile Advertising Reach and Targeting (SMART) report from Millennial Media, portals and directories led all mobile advertising verticals in mobile advertising spend during Q4 2009. Download the S.M.A.R.T. pdf here. 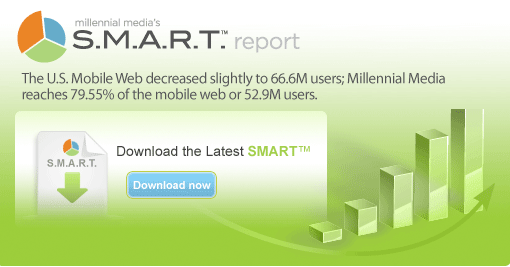 Interestingly, Millennial Media also reports the US Mobile web audience decreased slightly to 66.6 million users during Q4 2009. This entry was posted on January 29, 2010 at 3:46 pm and is filed under Mobile Advertising, SMART Report. You can follow any responses to this entry through the RSS 2.0 feed. You can leave a response, or trackback from your own site.